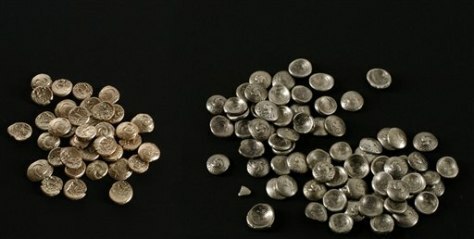 Trove of gold and silver coins was minted in middle of first century B.C. A hobbyist with a metal detector has found a cache of ancient Celtic and Germanic coins in a cornfield in the southern city of Maastricht. The city says the trove of 39 gold and 70 silver coins are dated to the middle of the first century B.C.